Size * -- Please Select --4" x 6" 6" x 10" 12" x 18" 18" x 36" 27" x 54" 36" x 60" 36" x 72" 45" x 90"
Buy Acadian flags from The Flag Shop. The Flag Shop carries Acadian flags in various sizes and fabrics. 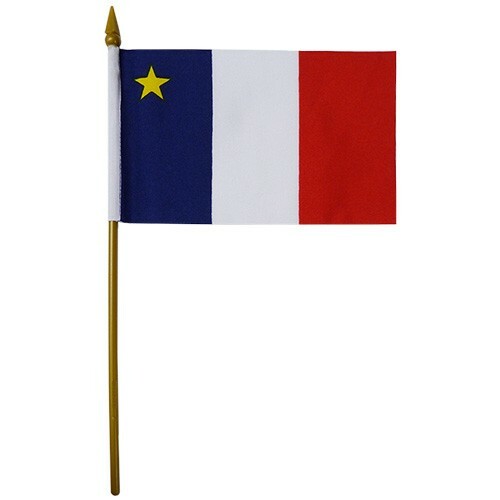 If you can not find the Acadian flags that you are looking for from our stock options, we can also custom print or sew Acadian flags according to your specifications. Contact The Flag Shop for more information. Acadia Tattoos, 2" x 1.5"